Great start, nailing the long techical leg to #1 and preceding to hit the next few cleanly. Everything was great until #6, where I lost 2 mins not having a clear attackpoint and getting confused between similar knolls. Ended up ~1.50 mins behind the leader so pretty annoyed at myself for the error, but otherwise happy. Low key evening sprint around Konnerud, a hilly suburb of Drammen. Mostly urban style, with some more interesting short legs at the end. Started off well, although possibly not picking the best route choice to #4, est 20 secs slower. Time for a day off. 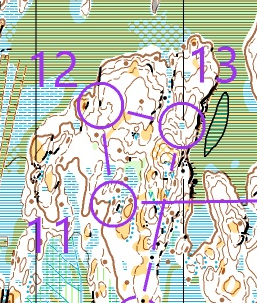 Great long distance practice on Gillingsrød, WOC 2019 relevant terrain. Ran the 7.2km course using the 2 recommended short-cuts. Today was mainly practising long and complex route choices, keeping concentration over the longer 1-2km legs. Felt good physically, and navigation was pretty good. One 1min error coming off the hill to #19, drifting west towards #4, staying high on the faster, nicer terrain. Middle distance training on Våler Varde. Focused on careful map contact in the detailed terrain with lower visibility & runnability than yesterday. Took it slow & steady. Nice and fast sprint race, with an interesting mix of urban apartment blocks and steep forest. A good warm-up in and set off at a smart pace. Started off first with no-one around in the terrain. Made approx 30 secs worth of errors & hesitations. Ended up 2nd behind a lad from Oppsal running on his local neighbourhood terrain, and ahead of some other prominent names. Lovely orienteering in semi-open wilderness forest at Akselås near Sarpsborg. Long distance course planned by Eva Jurenikova, practising simplification with some long route choices & compass bearings. Fantastic orienteering all round! Started off well, and finished steady. Didn't lose much time navigationally, max 1min from hesitations. No major mistakes and kept a smooth pace throughout. Came 6th today but only 1.22 down on second place, so we were all packing it in at the top. Solid run, which was the aim, so pretty happy.